A world-class colorist of international standing in modern glass, Stephen Rolfe Powell creates his work in a quiet outpost of rural Kentucky. His art and his life bridge other such divides. The radiant murrini skins of his glass vessels have an old Italian pedigree, yet his making techniques are radically American in their dramatic individuality. He is an award-winning classroom professor and a generous ambassador for glass, yet he is at the same time so uncompromising in his dedication to his creative work that he stands among modern glass's most nuanced seekers after the eternally sensual and elusive mysteries of light and color. 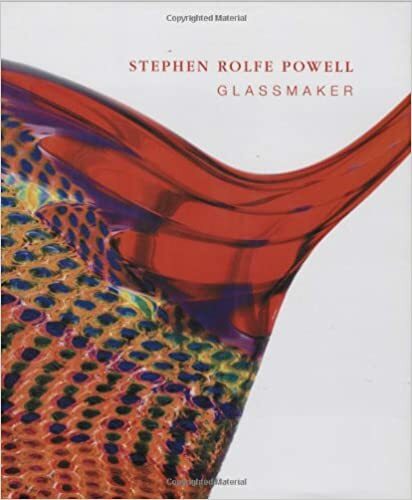 An illustrated chronicle of Powell's glass-blowing career, this book charts the evolution of Powell's remarkable body of work. Dazzling photographic close-ups detail the luminous murrini patterns that have become Powell's signature and reveal new ways of appreciating the complex interplay of color and texture in his art. Biographical and analytical essays by Mark Lucas, Laurie Winters, and James Yood explore such topics as the teamwork that is critical to Powell's unique glass making process; his teaching and learning experiences on the road, from the former Soviet Union to Salt Lake City during the Olympics; and the story of the two freak injuries that deeply affected his work and how he thinks about it. Reflections by Kenn Holsten, Marvin Lipofsky, Dante Marioni, Bonnie Marx, John Roush, and Lino Tagliapietra further supplement the book. The book's stunning photographs encourage the viewer to see Powell's work from different viewpoints, highlighting the unique interactions of transparent, opaque, and translucent glass and Powell's bold color combinations. Stephen Rolfe Powell: Glassmaker vividly portrays the tension and excitement involved in the artist's nontraditional, team approach to working with molten glass.